Model, downloadable immediately. One-time purchase, model updates are free. Free email customer support. Financial model template to track investments, proceeds, gains, writeoffs, and performance metrics for a portfolio of past and future venture investments. Used by venture capitalists, accelerators, and angel investors to track and report their portfolio performance. Unlocked - use in Excel or Google Sheets, edit anything - new model in May 2018. 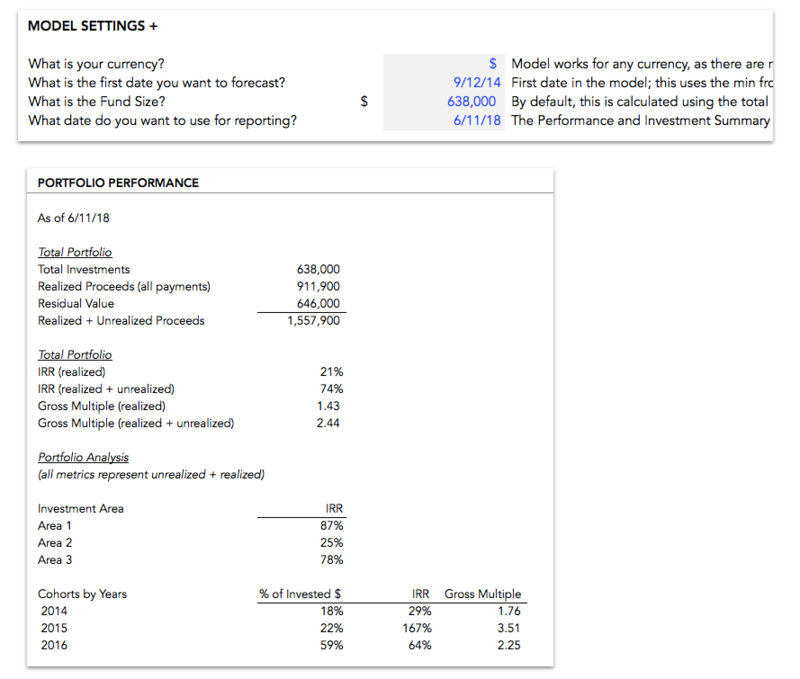 Financial model template to track the performance of your venture investments - investments, proceeds, gains, writeoffs, and more - and the model automatically creates portfolio performance reports, including IRR, gross multiples, and more. Detailed system for tracking the performance of investments with a categorization system that allows for you to analyze the portfolio’s results by cohorts and categories for your investments. Works for different structures for investments and returns - equity, debt, warrants, convertibles, revenue sharing, and tracks unrealized gains as well as realized events. Optionally, add in forecasted events to create a forecast for the portfolio. Summarizes key performance metrics for LPs and GPs. Calculates IRR, ROI, and gross and net multiples, as well as Residual Value, Paid In Capital (PIC), Distributed to Paid in Capital (DPI), Residual Value to Paid in Capital (RVPI), Total Value to Paid in Capital (TVPI) over the fund’s lifetime. Used by investors — venture funds, angels, incubators, accelerators — that need to track a portfolio of venture investments and report portfolio and category-level metrics on the performance of their investments. Investment Summary and Cash Flows: Added a set of calcs to calculate the investments by cohort of quarter invested and year invested, to break down the performance of the portfolio and help demonstrate how the investments have “cured” over time. Performance: Edited the metrics shown to bring in the cohorts. I fully expect people to edit the summaries and this Performance tab to highlight the metrics they want to communicate. I build standards-based, rock solid financial models to solve real business problems. Here’s what’s inside the Venture Portfolio Model. The structure is flexible enough to work for different structures for investments and returns - equity, debt, warrants, convertibles, revenue sharing, and more. The model uses a detailed system for tracking the performance of investments with a categorization system that allows for you to analyze the portfolio’s results at an overall level, by cohorts, by user-defined categories, and for individual companies. The Cash Flows sheet create the core calculations for the model, taking the data from the Investment and Proceeds sheet and aggregating it into quarters, tracking the overall portfolio, individual companies, and each of the categories set in the Get Started. There are no inputs on this sheet, except for the inputs around fund cash flows if you wish to track management fees, capital calls, and other expenses that are incurred outside of the investment activity. 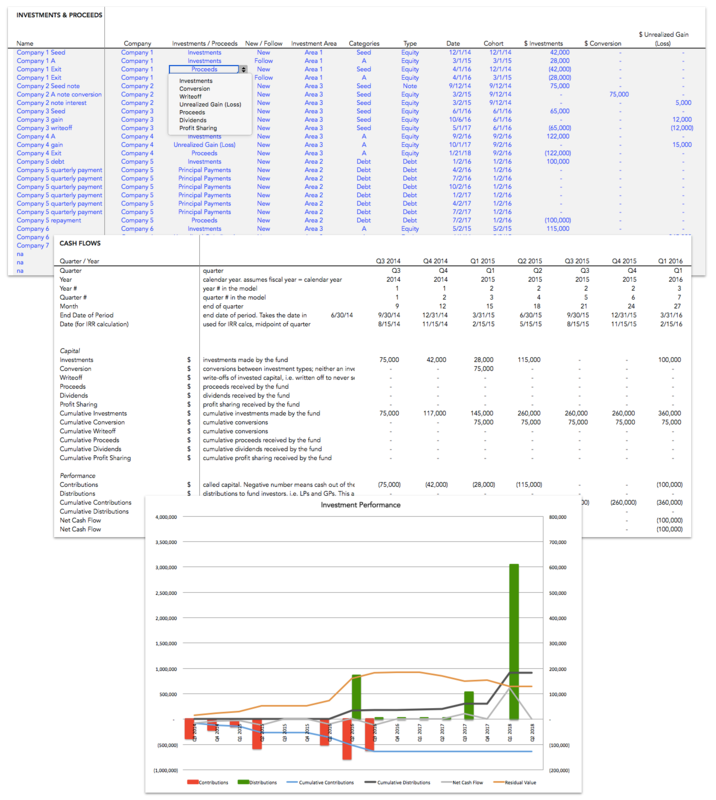 The cash flows sheet shows all the results over all of the time periods of the events in the model. The Investment Summaries sheet pulls from the Cash Flows sheet to report the metrics - total investments, total proceeds, IRR, gross multiple, ROI, and more - for the portfolio, each category, and each company, as of the reporting date you select. The Performance sheet displays a few key portfolio performance metrics and creates a chart that shows investments, proceeds, net cash flow, cumulative investments, cumulative proceeds, and residual value over time. As with all the reports, the chart automatically adjusts to the date ranges in the model. Optionally, the Portfolio Model supports forecasting. Just like you enter in known events, it’s possible to enter in future events - new investments, follow-ons, up rounds with unrealized gains, exits, write-offs, etc. - in a very granular manner. Since all the performance reporting is variable to the reporting date selected, you can easily enter in forecasted events and change the reporting date to include the future events, and the model will then include the forecated events in the performance reporting. 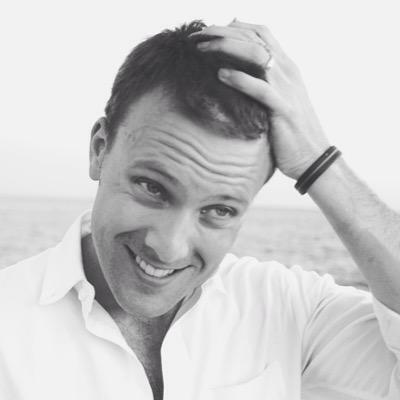 The difference between the Venture Investor Model and the Venture Portfolio Model is that the forecasting is much more automated in the former, and it’s specifically built to average results over periods of time to create forecasts that are less volatile to small input decisions around events and event timing. The Venture Portfolio Model is best used for forecasting a smaller range of events based on the current portfolio, to see the impact of the future on the overall results. Tools built for investors to forecast and track their invesments. I’ve worked with over 306 funds, angels, and venture investors since 2014 on portfolio forecasting and performance analysis. Used by over 306 venture funds, angel investors, and accelerators worldwide to forecast their investments, portfolio, and returns for their venture investment strategy. Creates full limited partner and general partner economics, a full set of key metrics around the fund’s performance, and a set of consolidated financial statements for the fund. Track investments, proceeds, unrealized gains and losses, and exits, of a portfolio of investments, automatically calculating IRRs, ROIs, multiples, and all fund performance metrics. This works for investors in privately-held companies using equity or debt instruments (convertible debt as well as debt with principal and/or interest payments), crypto investments, warrants, revenue sharing, investments as limited partners in funds, accelerators, angel groups, and more. Downloaded over 5,655 times, a free tool that models a single company through multiple rounds of investment (equity, convertible instruments, SAFE) and shows how valuations, option pools, and raising money impact dilution and share ownership. Then, creates a full waterfall showing what the distribution of proceeds would be to all shareholders at exit. Additionally includes standalone instructional sheets detailing the mechanics behind new fundraising rounds, converting convertible notes, and distributing proceeds. Used by entrepreneurs to evaluate their funding strategy and their dilution, used by investors to forecast their proceeds based on current round valuation and potential future rounds. We’ll do a 15 minute screenshare or call to talk about your needs and walk you through the Venture Portfolio Model (or others) to help figure out the right solution for you.